When it comes to investing, a key ingredient to success is diversification. Simply put, it is the act of reducing risk by distributing resources among various financial instruments. Diversification can happen not only within a single asset class such as equity, but can also be achieved among various asset classes. For instance, retail investors may consider investing commodity besides equity and debt. Unlike popular perception, investing commodity is not as complicated or risky and offer immense potential for market-savvy investors. Now that you know what are commodities investments, it is a good idea to know there are three main exchanges where you can trade in commodities. These are the National Commodity and Derivatives Exchange (NCDEX), Multi Commodity Exchange of India (MCX) and the National Multi Commodity Exchange of India. All the three exchanges have a national presence and electronic trading and settlement systems and can offer benefits of investing in commodities. There are a host of equity traders who have a well established presence in commodities as well, and offer trading facilities through the internet platform. If you are new to trading, you can also check the list of brokers registered with the above exchanges to make a final choice. You can begin trade by entering into an agreement with the broker and undergo the normal Know Your Customer (KYC) procedure. Besides a bank account, you will need a commodity demat account from National Securities Depository Ltd. You will need to pay your broker a percentage of the contract value. 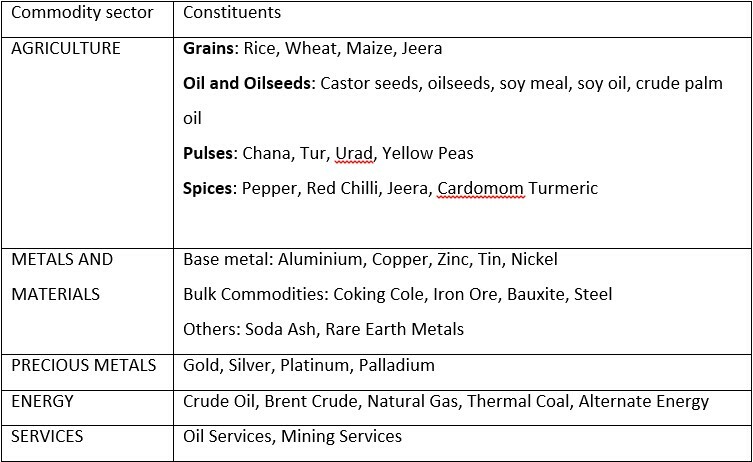 For different commodities there will be different brokerages. It will also differ on the basis of transaction type meaning trading or delivery. However, it cannot exceed the maximum limit as specified by the commodity exchanges. There are two types of prices in commodity trading: spot and future. ● Future price is the price of the same commodity at a future date. A futures contract is thus an agreement to buy or sell a stipulated amount of a commodity of your choice at a certain price on a future date. On this date, the commodity being traded (type and quantity) must be delivered at the contracted price, irrespective of a rise of fall in the market price. Trading in commodity futures is done on margin. This means, as an investor you have deposit only a fraction of the futures contract with the broker. This provides higher leverage and the option to reap higher returns. A contract may be settled through a cash or a delivery mechanism. If you want a cash settlement, you must indicate so at the time of placing an order. Else, if you wish to make a delivery, you need to have the required warehouse receipts. You have the option of changing this mechanism as many times till the expiry of the contract date. How does a transaction take place? A transaction is made electronically between the brokers of both the buyer and seller of a commodity. Both parties enter into respective obligations. While one party decides to purchase, the other decides to sell. The buyer is obliged to take delivery and pay for the commodity for the ascertained price, while the seller has the obligation to deliver the commodity on the said date. Both the buyer and seller can however absolve themselves can absolve themselves of this obligation by offsetting their trade before contract expiry. This is what most speculators do to make gains by speculating on the direction of the price of the commodity. How is commodity trading advantageous? The right mix of commodities in your portfolio can help your portfolio as they are an excellent means of diversification. For instance, gold has a low co-relation to equities and will typically provide gains when equities are down. You could also consider mutual funds investing in commodities to add to your portfolio. Further, as commodity prices determine inflation, investing in commodity futures may be used as a hedge against inflation. However, it is imperative to understand the risks involved in commodity trading before taking a leap.